Imagine a tornado heading your way and everyone is down inside the basement seeking refuge. Power are all knocked out as a result while you sit out the twister in darkness. The tornado is gone but you find yourself still stuck in basement as the debris from all the destruction is blocking the passage. Your mobile phone is out of juice and you weren't able to charge your phone since the power, mentioned earlier, was out. You are unable to contact the outside world for help. Uh-oh. This is where SpareOne Emergency Phone come in. 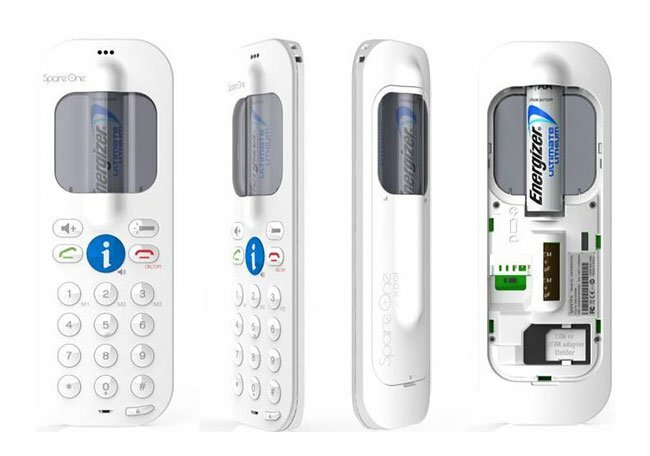 With a single AA-size battery, this phone can last 15 years without usage and give you 10 hours of talk time once you activated it. Just slip in the SIM card from your dead phone and fire this baby up and voila! You're saved! Granted that we don't have tornados in Singapore but perhaps a scenario like your car has broken down in the middle of nowhere... wait. Middle of nowhere? Singapore? wahahaahahaaha!! Taxi hiding until midnight surcharge kicks in, right? Actually, I think middle of nowhere probably refers to the context of your Malaysia road trip or something. What about keeping one of these in the bomb shelter of your HDB flat? You DO KNOW that the little room in your HDB flat is a bomb shelter and NOT your store room right? Right? RIGHT? Bear in mind the SpareOne mobile, without a SIM card, would still allow you to make emergency phone calls. But here's the thing that bothers me. Yes. You buy one of these and you chuck it inside the safe room for that emergency. Won't the battery acid-leak over time? We have all seen how batteries end up after years of neglect. I don't think any battery manufacturer will guarantee no acid-leak from the product for as long as a 15-year period? So what good is the phone if you have to use the phone and the battery has long disintegrated into a mush of brown slime? Perhaps experts out there can help enlighten? Out there in the market also addressing this emergency issue, is the hand-crank charger but product reviews have pointed unfavourably as the hand-crank is hard to operate and gives only a few minutes of juice. Still, a few minutes may be all that it takes to make a difference between life and death. Then, there is also the solar-panel charger. If you hiding in the basement or bomb shelter, the solar-panel charger is going to be as useful as the underwater hair-dryer. I brought up the hand-crank phone charger because it actually exists in the market. I have yet to come a cross and breath blown prototype which I am guess is a little wind mill inside. Apple Accessories: It is quite a nifty idea but there are several issues like I mentioned in my entry that needs to be addressed first. Without that, I doubt if the product will take off and fade into oblivion over time.